Kelly's Korner: Let's go to the movies! Saturday we found ourselves with an unexpected free day and we thought it would be fun to get out and do something as a family. Scott was gone on a work trip last week and we were all glad to be back together. We rarely....(or basically never) go out to eat anymore because it can be just too stressful but we decided to go out for lunch and then go to a movie. So we ate lunch at a pizza place and luckily it wasn't crowded and we had a good time. Harper was really good except when she got up after we were done and started putting on a dance recital in the middle of the restaurant. I guess I have to try dance class again. She asks about it EVERY day and is obsessed with dancing right now. I took Harper to her first movie this summer and she did great but we haven't had a chance to go back. There is a very small theatre near us that I knew wouldn't be crowded so I thought we would try and go and see the Muppets. I knew Harper would do okay but I wasn't sure how Hollis would fare. Harper did really good and had a lot of fun at the movie. But she had to have the fun with daddy because this little muppet just didn't do too well in a movie. I was hoping she might drink a bottle and take a nap since it was nap time and it was dark but she wasn't interested. So I left with her and took her for a drive. She fell fast asleep so I went back to the movie and we were good for about 15 minutes until she woke back up. So she and I spent most of the movie in the car just hanging out. But it was worth it for Scott and Harper to have fun. Thankfully there were only two other moms and children in the theatre so all my coming and going wasn't too embarrassing. 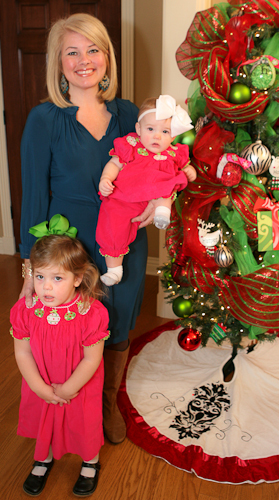 The girls and I took a picture in front of the tree before church this morning. I wanted to do this because we have done it the last 3 Christmases in a row. I love to watch us grow. (They are growing up - I seem to be growing out). 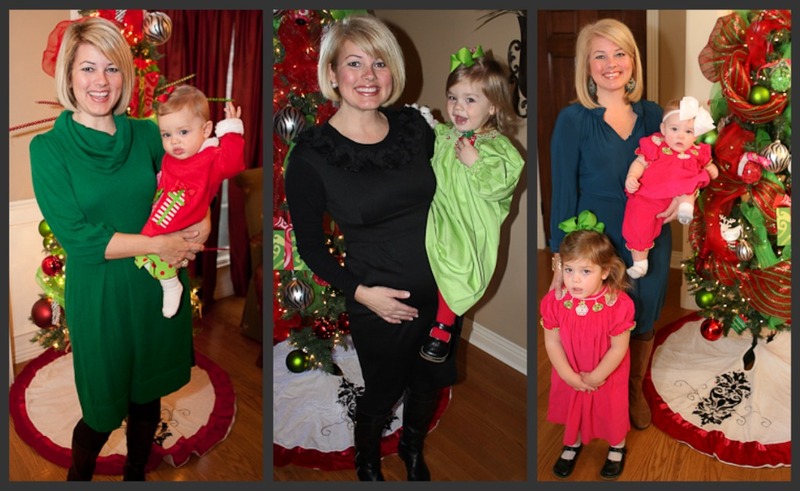 2009 - My first Christmas with Harper, 2010 - expecting Hollis and Harper's 2nd Christmas and 2011. Thankful for my blessings this Christmas! Thankful for Jesus. Thankful for abundant life!